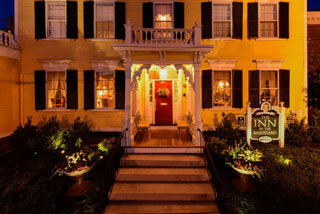 The Inn by the Bandstand is an awarding-winning boutique hotel located in the heart of historic downtown Exeter, New Hampshire and it is one of the premier places to stay in the New Hampshire Seacoast. Housed in an historic 1809 Federal-style mansion, it is only two blocks from the prestigious Phillips Exeter Academy, eight miles from the seacoast, 20 minutes from Portsmouth and Manchester’s airport is 30 minutes away. The elegant Inn offers nine beautifully furnished rooms with precious antiques and works of art - all with private baths, top of the line linens and seven with working fireplaces. 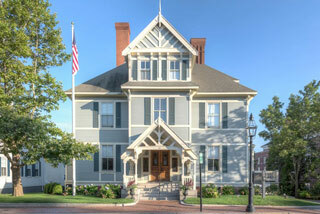 Grand, yet boutique, gracious and welcoming, our Portsmouth boutique hotel offers all the amenities of a large hotel with the irrepressible charm of a bed and breakfast. Looking for the strongest cup of fresh-brewed joe? Need a recommendation for the tastiest lobster roll on the docks? The Hotel Portsmouth staff has the inside scoop on the all of the local hotspots, with most located just a leisurely stroll from our front steps. Come experience modern hospitality in a historic setting at The Hotel Portsmouth: we know what you’re looking for.